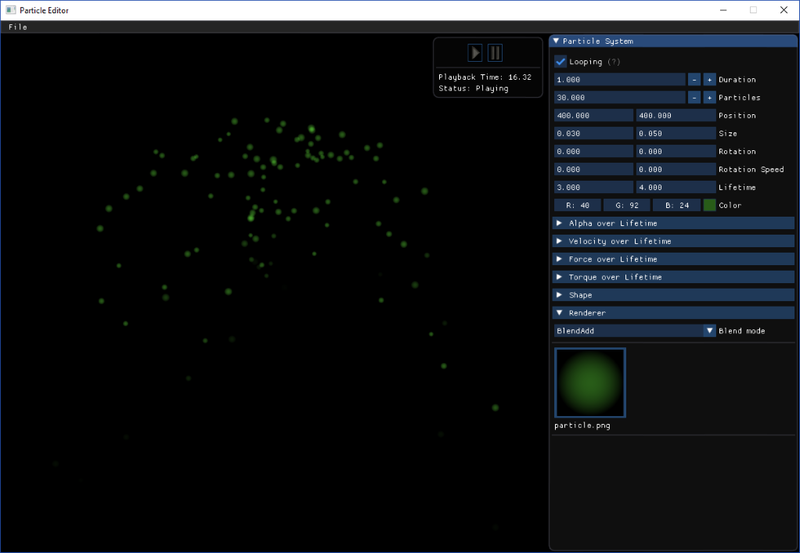 Integrating the saved particle data into a project is very easy and example code can be found at the github repository. Out of interest, was it generally easy to work with the emitters and animations, or did you run into limitations/problems? Yes, pretty much everything was easy to work with and it's all fairly simple but of course it becomes a bit more tedious when you have to create an editor for it as you for instance have to check the numeric limits of properties. I haven't tried the animation part yet but one thing that could be a limitation is the possibility to simulate explosion effects more easily. The firework example on Git is good but when you try to achieve the same effect with an editor it quickly becomes a lot harder .